On 24/05/2018, ROP 03 teams of C/206 moved out from Tamilwada camp at 0620 Hrs. Bike party escorting trucks which was carrying kote, Mess, Store has crossed camp Pushwada. After 2 KM of Pushwada near newly constructed bridge, troops noticed heap of mud and SI/GD Rajesh Kumar Bind got down from the bike and started searching nearby area, while searching a pressure IED blast took place in which SI/GD Rajesh Kumar Bind of 206 CoBRA Bn got serious injuries. 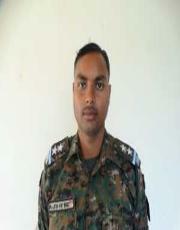 As a result of which, SI/GD Rajesh Kumar Bind laying down his life in the line of duty for cause of nation.